A few months ago I stepped away from football blogging. It took me too long to marshal my facts and thoughts, and my teaching job is consuming (I'm having a good year so far). But more importantly, I just felt that there were better minds on the case within the Seahawks blogosphere. I don't want to be a pretender, like the Seahawks' 2007 defense. I don't want to be regarded as more knowledgeable than I am. I've now started another blog, this one centered around my pursuit of Jesus Christ. He and the faith built around him are a much more natural fit for my mind and style. It's a much simpler and more refreshing arena, really an emotional antipole to 17 Power, girded with messages I really believe Christian millennials should hear. I hope this new effort interests and encourages you. It'd be enjoyable to see you over there once in a while. In the meantime, my sincerest thanks for all your interest and discussion over the years. I'll remain present on Twitter at @17power. Today was a go/no-go for the Seahawks. Fork in the road, with a left turn leading straight to <.500. Today the Seahawks picked the road less traveled by, sneaking past the underrated Carolina Panthers with a gorgeous TD throw by Russell Wilson down the seam to tight end Luke Willson. I likes. With all the injuries hampering our play on both sides of the ball (and if you ask me, the injuries haven't gotten nearly enough credit for the team's struggles), it was good to see the Seahawks get back to winning ugly instead of losing pretty. That they did it on the road was reassuring. That they quietly cut down on the penalties was even more promising. That they gave their young bucks an opportunity to contribute and benefited from it - despite an infuriating stream of simple mistakes and missed opportunities from top to bottom - the young play may have been the most important feather in Pete Carroll's cap today. The Seahawks' struggles lately are very simple: they're a victim of their own success. They've reminded the league how to play football. Other teams are adopting physical play, reliance on the run, and tools like the zone read. They're also taking the same strategy to Seattle's defense that one would Peyton Manning: keep 'em off the field. A steady dose of patient playcalling from the last few opponents has left Seattle's defense worn down by the end, prone to last-minute heroics. Teams have found ways to hurt Seattle right in its philosophy. Today, Carolina ignored that strategy and paid for it in the final minute against Seattle's refreshed defense. Kudos to Russell Wilson for that final drive, but honestly, greater kudos to him for maintaining longer drives earlier in the field. It left the defense ready to close the deal. It was good to see Seattle's youth step up, because it's time the coaching staff started closely examining what they've got on the bench. Keeping a Super Bowl team together is financially impossible, but it's starting to feel like the Seahawks hit reloading mode a little sooner and a little harder than even the most realistic of us expected. Left tackle is a question mark again. Our front seven is starting to show some holes. In general, the defensive line isn't getting the push they used to, and today's improved performance came against an injury-ravaged offensive line. So when our rookies and sophomores started filling in the gaps, it was welcome. But...that's all they did. We've got some backup linebackers that can flash and make some nifty plays in Kevin Pierre-Louis and Brock Coyle (go Griz! ), but that's starting to feel like a good description for starter Malcolm Smith as well. Luke Willson and Cooper Helfet - look, it needs to be said, they're not Pro Bowl material. They're simply coming through on a weapon-starved team. They're raw on their fundamentals. But they stepped up when they were needed and never gave up. (Schools, corporations, and armies win on the backs of such people.) It still remains to be seen whether Bruce Irvin can become a consistent force at DE, and he's had quite a while to prove himself. Robert Turbin and Christine Michael are not the future. They're spot players, with due credit to Turbin for the hardy catch-and-runs he's showing lately. The staff needs to make more use of him there. Then there's receiver. Until the Seahawks find themselves a Kelvin Benjamin, they'll probably be scrambling to win ugly more often than not. Don't get me wrong, we've had extraordinary luck with the receivers we have; scrappy, hard-hitting, full of fire, including what's looking vaguely like a possession receiver in Paul Richardson. These guys make the most of their opportunities, and I stand by that despite the numerous drops this month. But there's just no substitute for a catch-soaking #1 who can drag defenders deep and outleap even the tightest of coverage. You saw those benefits for Carolina today. It would just open up so much for the offense, which up until this point has looked like it's playing in the redzone all the time because of the limited ground our receivers cover. They just don't use space like they could. Between all these shades of grey, it's not insane to think that Seattle could still benefit from another trip to the draft. Perhaps they have the bullets already waiting in the wings. Injuries have a silver lining: they afford a showcase for unknown talent on the bench. Countless NFL talents have gotten their chances that way. But there are some pieces that remain elusive for Seattle (and indeed for most teams, like that epic #1 receiver) that will not be found on the bench. Whatever. We won. My criticisms aside, all our guys showed up and played hard when it counted. Sixty minutes. And that's the most encouraging component of today's victory. The Seahawks showed character and resilience against the Panthers. With rumors of locker room divisions and departing stars swirling around the team like so much fog the last couple weeks, and with so many starters on the bench...most teams would not have been in a position to steal a win from a physical, promising conference rival like Carolina, especially in their house. But Seattle pulled it off. And they did it with their usual formula - run, physical, turnovers, Wilson's legs. It was a relief to see that the formula is not defunct. Execution needs a shot in the arm. Max Unger and Zach Miller (underrated cogs in the run game, both of them) are sorely missed. Bobby Wagner is missed. Byron Maxwell was admirably covered for today, and you'd hope so given Seattle's emphasis on DB depth. And what is with the 12-men-on-the-field penalties lately? But this team still has a lot of fight in it. The flaccid 2009 team was marked not so much by lack of talent as lack of hope. This team is not that team, nowhere close. And as long as that fight is there, the Seahawks can do what they did last year: hunker down and wait for their starters to return from injury. Next week, the intrepid and unexpected Raiders QB Derek Carr has to demonstrate the patience and decision-making of Rivers and Romo if he expects to keep Seattle's offense off its own field. The Carolina game was a good matchup for Seattle, as Cam Newton is not the type of QB to avoid feeding the Legion. Carr is efficient and minimalist, closer to the necessary mold, but his running game is off track despite its talented backs. Their defense is pitiful. Quick rant: another day, another game where careful study shows how overrated the importance of the offensive line is. Seattle's pass protection bounced back from last week's undeniably bad showing, but once again, far too much is being assumed. On the go-ahead touchdown throw to Luke Willson, the announcers immediately and instinctively credited good pass protection. Watch the TD again. It's a three-step drop from shotgun. Step, plant, throw. A quick timing play. The role of the offensive line is minimal in that kind of play - delay your man for a split second and you've got it. Yet instead of such nuances, the announcers just tossed up the idea that pass protection must have been amazing since Russell didn't run and the pass was complete. That's ignoring a lot. Broadcasters trade in cliches, and many of them are valid, but this is an instance of how excessively and reflexively chalking up good throws to the performance of the offensive line is a longstanding roadblock to fans' understanding of the game. When a football team struggles, especially after a xenith of accomplishment like the Super Bowl, we fans look for one problem. We like to look for one problem. It gives us a comforting feeling of control, a sense that the solution is close. It's easier to fix one thing than to fix a multitude. Because fixing a multitude of problems often requires a draft or three, or perhaps a coaching change. We don't want to hear about that. No, I'm not advocating either action for the Seahawks. But after seeing Seattle edged out at home by a good NFC team they're probably going to see in the playoffs, I'm willing to say there are problems with the Seattle Seahawks. Small problems. Surmountable problems. But nonetheless, a multitude. I don't think this really surprises any of us. We did win the Super Bowl. But many of us have, way in the back of our minds, the quiet nagging feeling that we won it despite. We won it despite inconsistent play-calling. We won it despite of injuries. We won it despite certain traits missing from our WR corps. We won it despite an offensive line that hasn't yet fully gelled. Now, on one hand, if we can win a Super Bowl with all those issues, it says a lot of good things about the Seahawks. On the other hand, it leaves us riding the razors' edge. Twice this year, the Seahawks have slipped on the edge and lost to good but beatable teams. Now it's happened at home, and it's got me going back to my blog. It's been said lately that people are beating Seattle by using Seattle's game: smashmouth, leatherhelmet play focused on big hits, the running game, and a QB less focused on being the all and more focused on simply completing each pass that comes. This is true, but it's even more true than people say. Other teams are playing Seattle's game in a way that many have not acknowledged: they're simply not making mistakes. This is the secret of Russell Wilson's success. He doesn't make a lot of mistakes. You're not seeing him throwing Hasselbecks into double coverage. This is the explanation for some of the passing game's struggles in Seattle: what you're actually seeing is an ordinary passing game with all the risky throws removed. Seriously, all. With most other QB's, you'd be seeing a lot more cringe-inducing Favres. Wilson's are so rare that you can remember them by the month. Tony Romo and Philip Rivers have beaten Seattle with this philosophy. They're contenting themselves with easier throws, taking what the defense gives them, filling in the gaps with heads-up improvisation, and they're doing it for four quarters. That's a patience reserved for few quarterbacks - the ones that appear in the playoffs. As for their defenses, missed tackles are rare and coverage assignments are tight. There's a lot to be said for staying out of one's own way, because it leaves the other team free to choke on its own miscues. Seattle's miscues are not huge. But they're adding up. A good football game is a teeter-totter of tiny mistakes, and twice this season, Seattle's end has been just low enough to leave Wilson's theatrics out in the wind by the close. Now...I feel good about Seattle losing to the more complete performance. And I feel good that teams must resort to physical, mistake-free football (Seattle's philosophy) to beat them. But we're still losing. And we're losing in a very gradual manner. Today, Luke Willson, Doug Baldwin, and Jermaine Kearse all dropped (or had interfered with) clutch catches they usually make. The receivers on Dallas' side, on the other hand, didn't drop theirs. On 3rd and 20 with 4:46 left to play and Dallas trailing, Bruce Irvin broke free on an edge rush and then whiffed twice on the sack of Tony Romo, who flashed a Wilson scramble and then got the ball into the hands of Terrence Williams way downfield. Early on, Byron Maxwell had his mitts all over a sure pick-six on the Seattle goal-line. Instead of triumphing, he dropped it. After last week's contest Seattle currently leads the universe in dropped picks. Over and over, DeMarco Murray and whatever nimble Swiss-army-knife guy to whom Tony Romo was slinging the ball would sidestep a Seahawks tackle and take it for another five yards. Our guys couldn't see to get into free space. Both teams had their injuries. Bobby Wagner on the sidelines is ugly. Seattle's cornerback depth is like the Mars rovers - you can't believe how long it's lasted, but you live every second expecting its sudden implosion. Dallas also lost key guys, but it didn't stop them like it stopped us. Hello, Marcus Burley on the outside. Dallas' offensive line had a couple of key holding penalties at crucial moments, enough to keep the game in question. But Russell Okung had his quickly-becoming-requisite two false starts to throw on top of a false start by the backup center. Dallas gave DeMarco Murray his touches. Seattle did not reciprocate with Marshawn Lynch. I'm not about to jump all over the playcalling, which is a series of responses to a constantly shifting and evolving animal whose results only seem to look like a philosophy and are judged by fans without context. None of you would do better. Neither would I. Personnel problems go into playcalling as well (having a backup center doesn't boost a coach's confidence in the run game). But despite that, at the end of the day, Dallas gave DeMarco Murray his touches. Seattle did not reciprocate with Marshawn Lynch. Losses like these are built brick by frustrating brick over sixty minutes by tiny mistakes. The score is close by the end, but you can always trace the loss back to a handful of moments. There is no one that stands out. It's the amalgamation of them that kills you. This is why I rarely gripe about officiating. There are always bad calls. They go against both teams. But even in Super Bowl XL, there were numerous opportunities Seattle missed that still could have changed things. Attrition has now struck twice this season, and the league is starting to smell blood. Who would like to see Seattle in command of these games as Dallas was, instead of racing to make up for their own mistakes and building an offense more through broken plays than intentional ones? I wish I could point to one thing, say "fix this", and leave you feeling like that's all it takes. Many writers are unconsciously led by that impulse. But it would be dishonest. Seattle amassed small chinks in every phase and in every unit today, kept themselves in it with gut and the Cowboys' perennial CenturyLink Field special-teams collapses, and then shattered at the end. A common story in the NFL. That sinking late-second-quarter feeling of "the mistakes are starting to pile up and we'll be vulnerable to a couple of clutch plays in the fourth quarter" is starting to become familiar. Indianapolis. Arizona. San Diego. Dallas. Credit where credit is due. And that's just it. The victory was earned by Tony Romo, who played one of the finest games of his career today. Seattle has shown that they can only be beaten by complete performances from solid teams. But that doesn't change the fact that they have been beaten. We need to be the solid team with a complete performance. That's how we won last year. Well, no - not really. Not often enough. Too often, we were the team with Russell Wilson's legs and a lot of sprightly luck. It's starting to feel like the Mars rovers. Complete football. It's what we need to attain. There is no substitute for it. No "Seahawks philosophy" or talented personnel pickup has ever been a substitute for it. Solid, mistake-free football. I wish I had a handy "this is the way out of worry" solution to suggest to fans while the Seattle coaching staff ignores it. Many of you came here hoping for one. But there isn't one. Resist the temptation to think along those lines. It's rarely the case. The Seahawks simply have to go back to the tape, work on their craft, and cut down on the mistakes. There isn't much more to say. There isn't much more to do. And when you boil it all down, that's actually a really good thing to say about your football team. The Seattle Seahawks won the Super Bowl. The SEAHAWKS! Yeah, those Seahawks! Just four years after posting a 5-11 record, the Seattle Seahawks are world champions. After more than three decades without a championship, the city of Seattle is on top of the world. After two weeks of practically every NFL pundit shaking their talking head at Seattle's chances in the face of Peyton Manning's offensive onslaught, the legendary QB has been humbled and sent home by...MY TEAM. Whoa. My team. Out of all the working joes in the world, the football gods shine upon the team I'M rooting for. I get to be amongst the 3% of the world who can claim we did it. It's over. No more games. No more breakdowns, analyses, and predictions. No more practice reports, expert prognostications, fretting over matchups, or ignoring taunts from enemy fan bases. No more digging for news on lasting injuries, substance suspensions, or appeals. No more looking ahead. No more hand-wringing over what might have been. No more cursing the referees. The season is over. The Seahawks are on top of the pack. For the first time, the long six months of the offseason hold no angst over how close we came or what we need to reach the top next year. At long last, it's time to relax and bask in pure, unadulterated success. Actually, it does. In a number of ways. Russell Wilson throwing fourth-quarter picks and running for his life. Richard Sherman vomiting on the sidelines. Marshawn Lynch pumping his legs desperately from within a crowd of tacklers. Doug Baldwin being tossed about like a rag doll. Michael Bennett lying in a hospital bed, anxiously awaiting a CTC scan. Two Pro Bowl offensive linemen sitting thousands of miles away and powerless to help against a fully healthy Texans team. And yet here we stand, fans of the first 4-0 Seahawks team in history. The sheer incredulous delight is unspeakable. How do we quantify this? How do we capture the gritty, determined, unshakeable belief that this team displays week after week? The analyst in me wants to get to the source, wants to extrapolate it to next week. I want to know where it comes from. Maybe that's what bugs me. It doesn't feel like we can quantify it. It just happened. It's an intangible. I hate intangibles. I can't systemize or predict them, they just decide whether to happen or not. Or maybe what bugs me is the fact that the only discernible cause seems to be the gut and fortitude of QB Russell Wilson. When he gets going, things happen. Release the guy from the trap of Bevell's mewling play calls and opponents just start collapsing. And something in me sinks. That feels dangerous. I wish the trigger to Seattle's patented comebacks did NOT rest with one man. It feels like there's no redundancy there. Like it's not sustainable. Yet the Seahawks now stand on a nine-game streak of regular season wins, four of them those classic road nailbiters that all came down to fourth-quarter fireworks by Russell Wilson. Starting with the Bears, up to the present day. It sure doesn't look like a mirage or a situational fluke. Instead, it looks like a champion. I'm not sure what more the Seahawks can do to prove their readiness for the big stage. All they can do now is play on it. Some of us don't want to rest on intangibles. We want understandable factors, tangible causes and effects, something we can use to guess next week's outcome. We turn our noses up at "belief" and "resilience", dismissing it as the product of over-exciteable sports media, and try to explain things in terms of the X's and O's that make us feel more in control. And surely those played a part today. But this team's habit of winning ugly makes us feel frustratingly out of control. We truly are along for the ride with this team, no matter how many swings of momentum we experience along the way, no matter how many times Golden Tate stops our hearts by returning punts from the end zone, no matter how many of those awful ugh-I'm-done towel throws we suffer through. Have they let us down yet? Nothing should have gone right for the Seahawks today. We were on the road. The offensive line was spotted with backups against the AFC's finest defensive line. Our receivers were off their game against CB Jonathan Joseph. The Texans had actual receivers to throw at the Legion of Boom, and a QB to utilize them. It's hard to overstate just how much more talent Houston's passing offense boasts over our last three opponents. It's not even close. Schaub looked rattled in the second half, all right, but given time he can slice and dice the best of them, especially a Seattle linebacking corps that hadn't been truly tested in coverage yet. It's a fact that was lost amidst the mockery of Houston's slow start this year, and they chose today to unearth it again. For a while, the league's #1 defense was badly exposed. And on a day when Seattle looked determined to undermine themselves with timid and repetitive play-calling that played right into Houston's hands and away from Russell Wilson's strengths, it seemed that rawness and injury were just the recipe Houston needed. This went beyond simply needing a comeback. The Seahawks looked flat-out incompetent in all three phases and didn't have the bullets on offense to compensate. Halftime adjustments seemed pointless. I confess I was already trotting out the "it's just one game, better health will shift our fortunes" lines. But the darkness didn't hold. Perhaps I should say it was Doug Baldwin who actually flicked the switch, with his requisite weekly OMG-did-that-just-happen miracle catch (he has 123 yards on such catches in four games). Perhaps it was Wilson pulling more of that old spinning, freewheeling scramble magic and picking up first down after first down. Perhaps, as Richard Sherman said, it was the unexpected return of grievously injured Michael Bennett that sparked the team from the sidelines. Whatever it was, the defense heard it. They woke up and slammed the door on Matt Schaub in the fourth quarter. Seattle was outgained badly in yards and time of possession. Wilson was horribly beat in passing stats. They didn't get a third-down conversion until impossibly late. Schaub, at least for three quarters, was the one with the gaudy conventional whiz-bang that analysts eat up because they understand it. On this day, every number on the planet pointed towards a Houston win - maybe a close one, threatened briefly by admirable Seattle grit, but a Houston win nonetheless. Pete Carroll's team wouldn't be satisfied with anything less than a win. In the end, the numbers on the scoreboard contradicted every other. How Seattle continues to win with Wilson getting half the passing yards of the other guy, look 20 points down while leading by three, week in and week out is just crazy. This team keeps giving me reasons to silence my inner cynic. The irritable contrarian that wants to grouse about how Seattle needs an entire platoon of pass rushers to match the production of a single JJ Watt. The peevish churl who loses faith against any actual pocket-passing quarterback because we seem forever barred from finding the linebackers to shut him down. The nattering naysayer who's critical of the Michael Robinson cut and disappointed with our tight end situation and aching for a consistent separation receiver and OMG WHY CAN'T YOU GUYS JUST SUCCEED MORE CONVENTIONALLY SO MY SEAHAWKS FANDOM DOESN'T FEEL LIKE LIFE ON A HIGH WIRE!!! Yep, that guy needs to shut up. This is a game whose significance leapt beyond records and statistics and into the realm of statements, character, and immortal sports memories. No Seahawks game of the Pete Carroll era has had the odds more heavily stacked against them. Their resilience has done nothing but produce a string of wins and lead the team to its first-ever 4-0 start. At some point, success becomes hard to criticize. We're past that point. 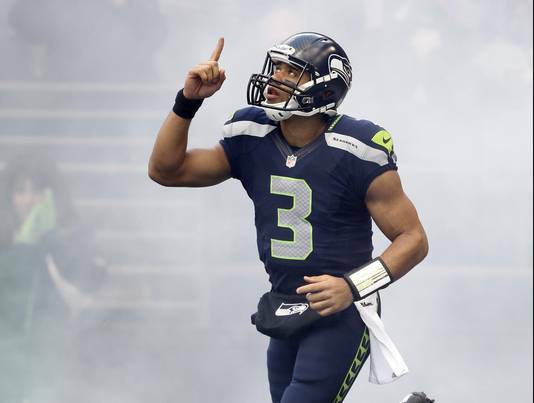 The Seahawks have nothing more to prove, except that they can win a Super Bowl. That is the lone remaining hurdle. This team has once again stared valley-of-the-shadow-of-death adversity in the face and overcome. If you don't yet grasp this team's entertainment factor, I don't know what you're waiting for. The Seahawks are where miracles happen. Repeatedly. John Morgan is once again blogging Seahawks. Recently, as I extricated myself from the cobwebs of summer, I found he had posted this. It's basically telling fans what they should be thinking right now: to wit, the Seahawks will win at some point in the Pete Carroll era, but there's no way to predict whether it will be this year. And therefore, we should not invest too much hope in 2013. Or something. I agree with the underlying idea. Lombardi trophies are hard to predict: they're basically won by the playoff team with the best turn of luck that year. Fine and good. Of course, Morgan fails to offer any concrete prediction of his own. And there's little to his actual prognostication besides some POW story and the observation that Russell Wilson gets almost-sacked a lot. (He probably posted a fuller analysis somewhere else, I can't be bothered to look right now.) But it's fair and defensible to say that projections can only go as far as the playoffs, and hope the ball bounces your way after that. It almost did for Seattle last year. What I really take exception to is the article's attempt to define hope. Or structure it, or reevaluate it, or constrain it like veal, whatever. The 2012 season has come to a close, and there's no way to view it as anything but a whopping success for the Seattle Seahawks. Against all seeming odds, we have found our quarterback of the future. We have a defense loaded with talent. Our offense is well-defined and resilient. And both sides of the ball are still on the way up, with our team philosophy firmly in place. It's a great note on which to end my brief career as a football blogger. Every once in a while, it's good to take note of what you're doing and ask whether you're making the most of your time and talent. The world is a struggling place, and needs each one of us to be exactly who we are, in the best manner we can manage. Perhaps that sentence makes football bloggers sound superfluous, but I don't think it has to be that way. Guys like the ones at Fieldgulls obviously have a life beyond football. They're contributing. Football is a passion for them that moves them to write, elevates others' thinking, lets us support our team and our cause in a smart and well-informed way. But when I started asking myself questions about maximizing my time and resources, my answers didn't fall in the same place. I'm a teacher. If there's one area of education that we could address before reflexively looking to blame government and money allocation, it would be teacher work ethic. The profession is filled with teachers who are checked out, phoning it in, going through the motions. They are shortchanging students of their highest potential and making harder the jobs of every teacher who comes after them. These kids are our country's future. Allow me a moment on the soapbox: if you are a teacher who's merely a placeholder and has no real interest in the dozens of children under your charge, then you need to get out. Now. It doesn't matter how hard it would be for you to find another job - the needs of the many outweigh the needs of the few. Step aside and allow your job to be filled by someone who loves children, believes in their subject, and has the patience and generosity to walk with them and turn them into the best they can be. That's my calling. And when it comes right down to it, I have neither the time nor the football knowledge to justify continuing this blog. I honestly don't know much about football. I really don't. That's not a diss on myself, and it's not fishing for reassurance. It's just a fact. I'm fine with not knowing much. What I do know comes from reading others. And one thing I don't want to be is a guy who's writing about his level, even if he can disguise it with his writing. Occasionally I'll have a perspective that nobody has yet touched, and can be written without a great deal of X's and O's. Those are my articles. But with the proliferation of new blogs and the riches of knowledge from others within the Seahawks blogosphere, those moments seem to become rarer and rarer. And I'm okay with that. As long as the thoughts are out there, does it matter who writes them? To be a quality blogger - and that's what I'd want to be if I were to keep doing this - you have to be a certain sort of person. You have to be a quick researcher. You must be able to dash off a well-supported, knowledgeable essay without taking days to write it. I'm not that sort. I start a piece with good intentions, take hours to write it, go back over it the next day, rewrite it at least twice, find new information that supports or contradicts my piece, rewrite it again, pull my hair out, and by the time I've gotten close to publishing, the entire week has gone by, everyone else has already talked about it, and posting it would seem lame and out-of-touch. Such is the fast-paced world of internet opinion. Perfectionists have no place in the world of blogging. You also have to have a certain objectivity, the ability to criticize football players who are working harder than any of us to achieve a dream that none of us could ever hope to achieve, along with that subtle dash of feigned world-weary snark that fleshes out your writing personality. I realized at some point this season that I don't want to be that guy. I'm too sentimental. Too longing. I wouldn't have the strength to be on the other end of the withering demands of football critics. I don't want to relish that tiny grin of sarcastic delight in blithely dismissing those fringe players laboring through the preseason for a spot only one of them, at most, can grab. And if I wouldn't want to be on the other end, I can't in good conscience stay on this one. That's for the people who can console themselves that those roster cuts will find other jobs and be perfectly fine. Hard for me to remember that, for some reason. I pondered all that this season and gradually realized that nothing in my internal monologue was pointing towards me as a long-term blogger. There was also the dawning realization of just how hard one has to work to achieve real profile as a sports critic - the regularity of posting, the demands of solid research, the networking and living on Twitter, the near-shameless self-promotion that turns bloggers into helpless self-retweeters who have no dignity but can't get any visibility any other way. That's how it has to happen, and I just realized I have no interest in it. Call it pride, call it laziness, call it lack of time management, call it I have a job, whatever. But I took one look at it and it turned me off to blogging as a side career. Not that having 600 followers and even more readers isn't worth it. You guys have been great. Wonderfully supportive even in my retarded moments. You've convinced me that I have a future in writing, even if it won't be in football (I may actually be starting another blog soon, this one revolving around Christianity, if you're into that sort of thing). I think I've carved out my little niche in the blogosphere, and am proud of the moments worth being proud of. It's just not fair keeping all of you guys on tenterhooks while I struggle to come up with a blogging voice that's probably just not going to come. The 2012 season has been a great ride. It's restored my hope in the Seahawks. It's seen the return of competitive balance in the NFL. The run still matters. Defense still matters. There's still plenty of room for innovation. I can't tell you how reassuring it's been to have my fears averted. The Seahawks are going to be around for a long time. What a great future the 12th Man has. And I will be sharing it with you. 17 Power is closing down, but I'll be lurking around and rooting with you. Maybe on Twitter. I do see a Lombardi trophy in our future, and I hope to see you around in the moment Russell Wilson hoists it up. Until then, don't let anyone tell you the odds. When you're cringing and peeking through your fingers with dreadful certainty of defeat, when hope is hard to cling to and seems to teeter on the edge of your long-earned cynicism, remember that you never know when some dude on the sidelines might call "17 Power". So long.